Use activities to plan and record customer interactions such as phone calls, tasks, or appointments. Your customer journeys can also generate these for you—usually for planning purposes. For example, you might create a journey like the one you made in Create an interactive customer journey with triggers and signup, and then add an Activity tile behind the trigger that creates a phone-call task associated with each contact who submits the registration form. 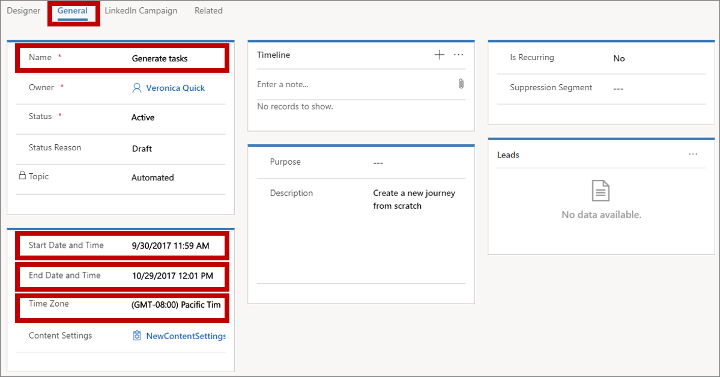 When you add an Activity tile to a customer journey, you'll choose an activity template, which establishes the type of activity it is, what it should be called, and more. Each contact who enters the tile during the journey will trigger creation of the activity, and that activity will also be associated with that specific contact. The contact is then forwarded immediately to the next tile in the journey. For this exercise, you'll set up a template to create task activities, and then set up a simple customer journey that generates a task associated with each member of a selected segment. Go to Marketing > Templates > Task Activity Marketing Templates. On the command bar, select +New. The New Task Activity Marketing Template page opens. Name: Enter a name for the template itself. This is the only setting here that doesn't affect the tasks created by the template. Subject: This will become the subject for each task created by the template. This is probably the most important setting. On the command bar, select Save to save your template. Go to Marketing > Marketing Execution > Customer Journeys. On the command bar, select +New to create a new journey. 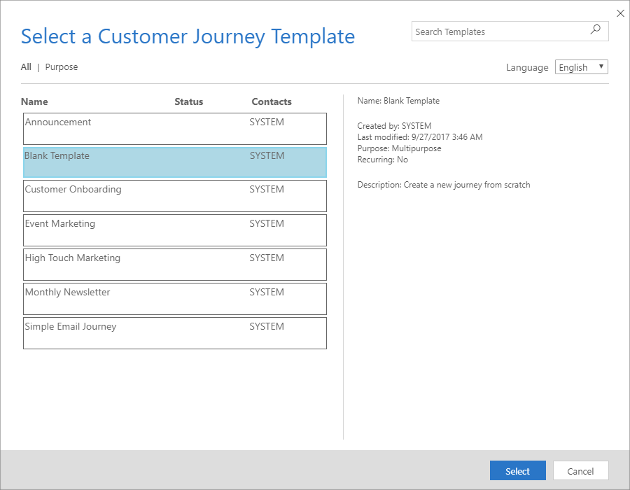 The Select a Customer Journey Template dialog box opens. Choose the Blank Template and then Select. Drag a Segment Group tile to the first position on the canvas, and then add an Activity tile right after it. Expand the Segment Group tile to expose its nested Segment tile. 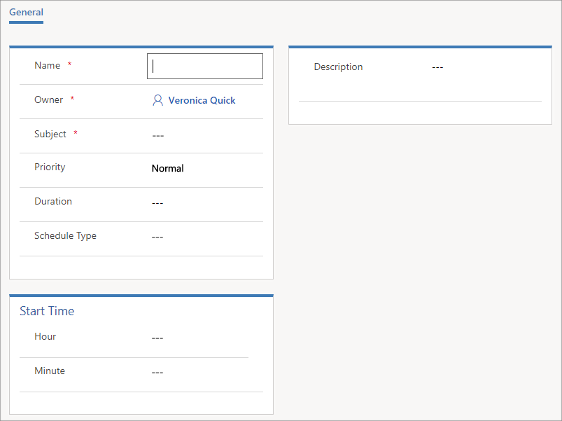 Then select the nested tile, open the Properties tab, and configure the tile to reference the segment you want to target. Select the Activity tile, and then open the Properties tab. Activity Type: Set to Task. Activity Template: Set to the name of the template you created earlier in this procedure. Assigned To: You might need to scroll down in the Properties tab to find this setting. This is the person to whom each task will be assigned. As you can see from the options here, you can assign each task to the customer journey owner, the owner of each contact, or to the creator of each contact. The best choice will depend on how your company is organized. For this exercise, choose Customer journey owner (which is you); this means that all tasks will be assigned to the same person—the other choices allow tasks to be assigned to different people based on values from the relevant contact record. On the command bar, select Save. Go to the General tab, and set the Name, Time Zone, Start Date and Time, and End Date and Time. You can set it to start right away, but allow it a few hours to run, just in case. A simple journey like this one might be useful for reminding staff to review key contacts each week. You can set this up by creating a segment that finds interesting contacts to work on for the week, and then use the Is Recurring settings on the General tab of your journey to rerun the journey once a week for as long as the journey is active. On the command bar, select Check for Errors, and then read the results and fix any problems reported. On the command bar, select Go Live to activate the journey. Go to Marketing > My Work > Tasks. From the view menu, select All Tasks to make sure you can see all tasks in the system. You should now see a list of tasks. After your journey has had time to run, you'll start to see your generated tasks here, with the Subject you specified for the template shown as the Subject and the Regarding value set to a contact from the segment you targeted with your journey.